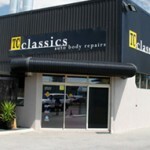 TC Classics is a family owned and operated business that offers high quality service to thousands of satisfied customers in Perth’s Northern suburbs since 1988. TC Classics offers a range of repairs from small dent removal to major chassis and alignment work and we strive to give our clients the best service. Our friendly staff have over 23 years of experience in vehicle repairs and have the most up to date facilities to handle your insurance claim. We are recognised by all the major insurance companies Australia wide.